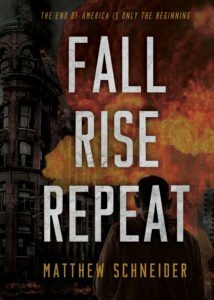 Aberdeen, NJ— Fall Rise Repeat is an exhilarating post-apocalypse thriller that will throw you into a world torn apart by the immediate confusion and devastating aftermath of a nuclear war. After war breaks out between the United States and Russia, and nuclear attacks wipe out forty-million people, the world finds itself in complete anarchy. As society struggles to survive, Xavier Starr becomes a first-hand witness and victim of the pure violence rippling through his entire society. Xavier must face the after-effects of this devastation which leaves him no choice but to make wrenching sacrifices and unbearable decisions. To ensure survival, he is forced to join the universal fight to improve what is left of America and the world he once knew. In this moment of pure chaos, dismaying violence, and looming death, Xavier finds himself the face of the new world, leading humanity in its struggle to restore balance and structure. He is suddenly thrust upon the chance to rule the United States and re-establish the still-reeling society. Yet he is unaware of his hardest challenge yet: is humanity doomed to repeat history? Matthew Schneider began his campaign in writing at the age of 17 with the publication of his first book: Fall, Rise, Repeat. Living in the small town Waukesha, Wisconsin, he often found the free time and quiet he needed to write and study music. Through social media and the Internet, Schneider has set a lifetime foundation to pursue his passions, transforming both of these hobbies into a profession. This book is now available for purchase through GenZ Publishing and Amazon. GenZ Publishing is an innovative publishing house for print and digital media, bringing a new model to the literary world. In the last two years, GenZ has published more than eight bestsellers and is proud to maintain its status of being the fastest growing company in the book publishing industry. The company offers new and emerging writers the opportunity to get discovered and to launch their publications with- out the hardship and prejudices that usually comes in this creative field. GenZ supports the voices of all generations from millennials to baby boomers to, of course, Generation Z and promotes industry change on through their high quantity of production of published writings. GenZ Publishing books are available in places such as Amazon, Barnes & Noble, and the Ingram catalogue, as well as on their online book- store. They’re proud to have their books read and beloved on the bookshelves of thousands of people around the world. For additional information found in the book press release of Fall Rise Repeat, please use our press con- tact and press information available.